Blackburn Center is working to engage men to help challenge cultural norms that reinforce harmful attitudes. Although most men are not violent towards women, many men do not recognize either their responsibility or their ability to help fight domestic and sexual assault. We need to change this! Research shows that 88% of men think that our society should do more to respect women and girls, and that 57% of men believe that they personally can make at least some difference in preventing domestic violence and sexual assault. Our goal is to provide education and support to help men in Westmoreland County mobilize for change. 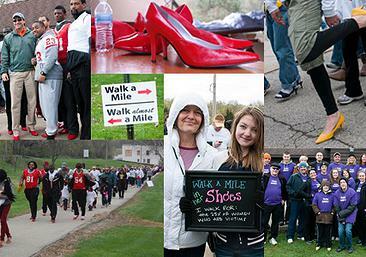 One way that men can participate in our mission is to “Walk a Mile in Her Shoes” each year — a visible way for men to support the mission to end gender violence. Beyond the walk, men can join us in our latest campaign, “It’s About the Journey” by signing our pledge against gender violence and actively committing to the principles espoused in it. Men can also volunteer for Blackburn Center in a number of capacities, and participate in Blackburn Center events throughout the year. Together, we can work together to make Westmoreland County a safer and healthier place for ALL residents!